X-43 is a NASA programme for tomorrow's launchers. The X-43 is a small machine (3.6 m long by 1.5 m span). With its flat aerodynamic profile and sleek lines, it looks thoroughly futuristic. But it cannot take off on its own. 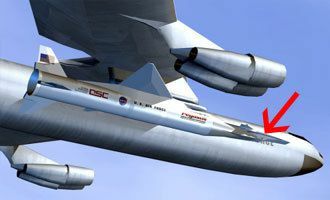 It is carried up to a certain altitude under the wing of a B-52 carrier, like the famous X-15s, and released in flight. But there the comparison ceases. Once it has been released, this ultra-sophisticated machine continues on its flight coupled to an independent thruster, a Pegasus airborne rocket from Orbital, which is also used to place small payloads in orbit. On 16 November 2004, the experimental hypersonic X-43A reached a speed of Mach 9.8 - or about 11 000 km/hour. Vincent Rausch, director of the NASA programme, described the event as historic. Only space shuttles regularly reach this speed. In 1967, the X-15 rocket plane reached Mach 6.7. The X-43A is mounted on a Pegasus rocket. The assembly is carried under the wing of a B-52.